Alana has seemed drawn to books of tragedy. She has dealt with a ton in her short life from situations of her own growing up to constantly being that go to person for her friends. The things she has had her friends confide in her with are already more than most adults go through in a lifetime. I think reading these stories help her to better understand those situations as well as how to deal with them moving forward. She is a very compassionate and educated teenager who carries the weight of the world on her shoulders some days. So when we were asked to review the book Why Did She Jump? - My Daughter's Battle with Bipolar Disorder by Joan E. Childs, I knew it would be one she might enjoy. I also knew there was no way it was one I'd be able to make it through as a parent of 3 children. The synopsis says "There is one day in Joan Child's life that she wishes she could do over: the day her daughter Pam, a brilliant psychotherapist, plunged from a fifteen-story building to her death. 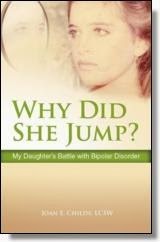 But despite the coroner's report of a suicide, Childs explains why her daughter's life was taken by the most unforgiving of executioners: bipolar disorder. It was the delusions, not her daughter, who made the final decision. Why Did She Jump? is an intimate, uncompromising delve into one mother's search for peace amid the chaos surrounding her daughter's tragic death, and a masterful recounting of the events leading up to the fateful day, lifting the veil of shame and secrecy to forge a path to understand bipolar disorder and other mental illnesses." My daughter found 'Why Did She Jump?' a very interesting book. She said it was written very well and she really felt for Joan, the mother, more than anything as the book is from her perspective. I think Joan handled the situation as best as she could and I think it was quite ironic that Joan has been practicing psychotherapy. It really is a heart-breaking book, as my daughter was reading she said she couldn't help but feel horrible for the family and what they were going though. She cried quite a bit while reading. As a parent going through all of that really would be like living my worst nightmare. Available to purchase/Cost: $11.96 Why Did She Jump? Recommendation: This is a good book for those who are going through a similar situation or the loss of a love one because it explains how Joan deals with losing her daughter and how she is able to finally let her daughter go so Joan can live with the pain but to move on with her life. Giveaway: HCI Books is going to give one of A Lucky Ladybug's lucky readers a copy of Why Did She Jump? to read of their own! Memoirs of a Geisha is my all time favorite book. Thanks for this opportunity! I love the book Wicked. My favorite book will always be Gypsy Rose Lee's memoir, Gypsy.